Happy Fall, friends. It’s time for spice, for apples & pears, crisp mornings, boots & comfy sweaters, marathons and so many other lovely – and delicious – things. This oatmeal is one of the delicious things. It’s a base of fall spices – cinnamon, nutmeg & cloves – topped with deliciously sweet pears, pecans for crunch and a little drizzle of milk. I’m a little sad to see summer go but if I can look forward to breakfasts like this one then I think I’ll be ok.
recipe notes: I made this up as I was going along, so it’s a bit of a rough draft. You could add more spices to the oatmeal or also add the spices to the pears. I used a fair amount of cinnamon sugar (probably a good 2 teaspoons for mine) but depending on how much sweet you like, use more or less. 1. In a small saucepan, bring 1 cup of water (or milk) to a boil. Stir in the gluten-free oats & turn down the heat to low. Stir occasionally until the liquid is absorbed and the mixture is thickened, about 10-15 minutes. Stir in a pinch each of salt, nutmeg & cloves, the cinnamon & vanilla. 2. Meanwhile, melt a small amount of butter over medium heat in a saute pan. Add the pears, cinnamon sugar and cook, stirring occasionally, until the pears have softened and the cinnamon sugar has formed a sweet glaze, about 10 minutes. 3. 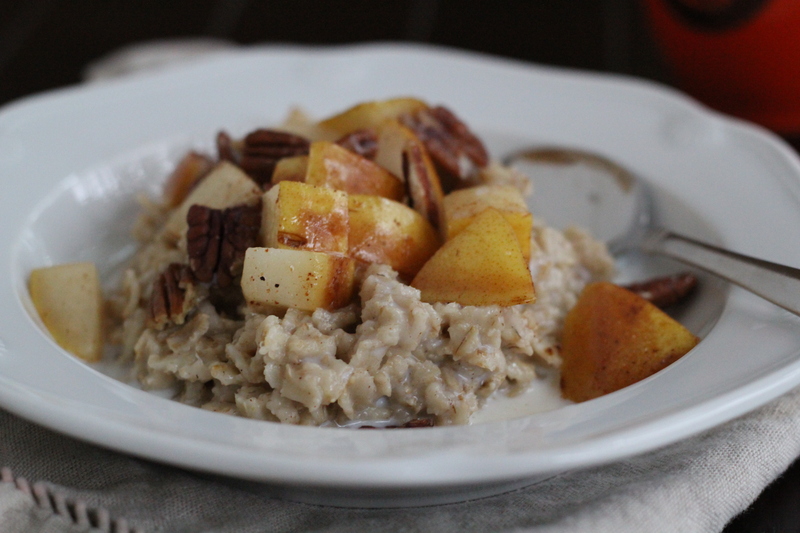 Place the cooked oats in a bowl, spoon the cinnamon sugar pear mixture over the oats and then top with pecans. What a lovely and warming combination of flavors and ingredients! This sounds so warm and comforting, I’d have loved a big bowl this morning. Hi Whitney! Feel free to share 🙂 And let me know what your kids think 🙂 I’m certainly not used to cooking for kids so would be curious to hear what they think!